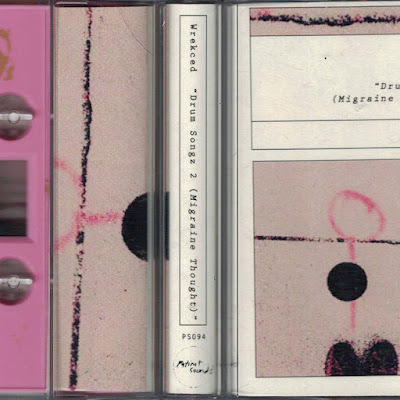 Erik Wangsvick returns with a new volume of WRECKED music for Patient Sounds (this is the 4th cassette of WRECKED music we have released). Recorded quite some time ago, before a move across country, from Colorado to New York City, this collection of fractured scrap yard junk pop and plunderphonic ambient noise is WRECKED and sharper than ever. Earnest and weird, full of fragmentary hooks and melodies and looming trashbarrel echoes. Ultimately damaged but loveable, like a rescue pet or a brilliant caveman. An outsider firmly aware of the limitations of normalcy, and unshakably comfortable making striking work with garbage. A bowerbird building a scrappy domicle from Radioshack trash. A note-worthy step forward in the evolution of this long-running rummage.